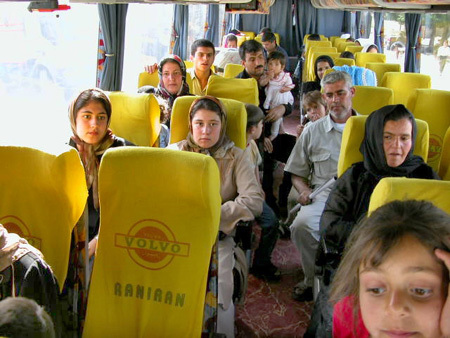 TEHRAN, 5 Jul 2004 (IRIN) - Some 80 Iraqi Kurdish refugees returned to northern Iraq recently from Iran as part of a pilot repatriation convoy by the office of the United Nations High Commissioner for Refugees (UNHCR). The refugees, who fled Iraq during Saddam Hussein's regime, had been living in Iran for over 15 years in the Ziveh refugee camp in the western Azarbaijan province. Fifty-six returned to Arbil and 24 to Dahuk. "With the opening of the northern Haj Omran border crossing near Piranshar city [south of Orumieh], these Kurdish refugees have finally been given an opportunity to return home via a more convenient northern route," said Philippe Lavanchy, UNHCR's representative in Iran. "We are very pleased that we can help ease returns for those who really wish to go back to the three northern governorates." The new border crossing at Haj Omran will be primarily used by Kurdish refugees, who fled northern Iraq during eviction campaigns in 1975, 1988 and 1991. Previously, those wanting to return to the north would have had to have used the other crossing in southern Iran at Shalamcheh in Khuzestan province. So far, 6,613 refugees have returned to Iraq, facilitated by the refugee agency. The returns took place via Shalamcheh border crossing and most of the returnees were Iraqis from southern Iran returning to Basra governorate. As the situation in Iraq remains unstable and precarious, UNHCR teams in Iran interviewed all returnees before their departure, briefing them on the security conditions in Iraq and ensuring their decision to return was voluntary and well-informed. Before leaving Iran, refugees also received mine awareness training provided by the Ansar Relief Institute. Doctors from IRAC, a charity for Iraqi refugees in Iran, were also available to address any health concerns. The 80 refugees were then given free transport by UNHCR to their final destination in northern Iraq. The refugee agency also provided cash assistance of US $20 per person and a package including plastic sheeting, kitchen sets, cooking stoves, jerry cans, blankets and mattresses to help them start a new life. They were transported to the border where they were met on the Iraqi side by government officials and UNHCR's partner, the International Rescue Committee (IRC). Documents were processed there and all returnees were registered. A transit centre has been set up in Dyana, an hour's drive from the border, where food, mine awareness training and medical assistance is provided by IRC and other NGOs on the ground, in case of severe medical requirements. "UNHCR is constantly monitoring the overall situation in Iraq, but due to the violence in various parts of the country and the fragile political situation, and with the handover just having taken place, UNHCR is not yet in a position to encourage all Iraqi refugees to go back," Henrik Nordentoft, UNHCR deputy representative, told IRIN in Tehran. UNHCR Iran said it had received many enquiries from Iraqi refugees who want to return to their country after the fall of Saddam Hussein's regime last year. The border between Iran and Iraq is one of the most heavily mined in the world, making spontaneous crossings extremely dangerous and UNHCR strongly advised Iraqi refugees not to attempt the crossing on their own. Refugees were keen to return themselves as they felt that the situation in their home towns had improved and was relatively stable, Nordentoft said. "Many refugees who have stayed outside for long periods will often feel a strong urge to return at the earliest possibility, and some may do so weighing the pros and cons. This is why UNHCR is facilitating the return for the refugees who have made up their minds after careful consideration," he explained. Most Iraqi refugees in Iran are Shi'ite Muslims of Arab descent. Coming from southern Iraq, near Basra, they fled Iraq in the aftermath of the first Gulf war in 1991 when Saddam Hussein issued a crackdown on Shi'ite rebellions in the south. It is estimated that around 1.3 million Iraqis crossed the border into Iran at that time. Around 22 per cent are Kurds. There were over 202,000 Iraqi refugees in Iran in September 2003 - over half the entire Iraqi refugee population in the world. About 50,000 of them are housed in 22 refugee camps in Iran, which are situated along the country's western border with Iraq - this number is significantly higher than that for Afghan refugees, of whom only about 2 percent live in camps. The majority of Iraqi refugees - about 150,000 - live in urban areas in western Iran. In total, more than 11,500 Iraqis have returned in convoys facilitated by UNHCR from Iran, Saudi Arabia and Lebanon since the end of the war that led to the downfall of Saddam Hussein.